Today is September 10th, which is known to meteorologist as the “peak” of the tropical cyclone season in the Atlantic Basin. To answer that, let’s talk a little bit about climatology. Research meteorologists will take past weather events and combine them to provide statistical information about a particular weather phenomena. In the case of tropical cyclones (which encompass all types of systems, including tropical storms, hurricanes, typhoons, etc), scientists have been able to keep track of their location and intensity estimates as far back as the 1850s. In fact, the National Hurricane Center has an excellent webpage about their climatology using a dataset called HURDAT. Statistical summation of the number of tropical systems per 100 years in the Atlantic Basin. Yellow indicates hurricanes (winds exceeding 74 mph) and red shows both hurricanes and tropical storms (winds less than 74 mph). Source of information comes from NOAA’s National Hurricane Center. Tropical Cyclone season in the Atlantic Basin is from June 1st to November 30th. The peak of the season occurs on September 10th. While these provide general guidelines from year to year, it does not mean current systems follow this rule. The graphic above clearly shows that cyclones can happen before June 1st, and after November 30th, but their occurrence is much rarer than it would be around the September 10th peak. In fact, Alberto formed on May 25th of this year, a few days before the official start of the season. Also, just because the peak of the season is September 10th does not mean cyclones are at their strongest. Strong systems can be seen all year round. This brings up the question of weather versus climate. A good analogy I’ve heard is the following: “Weather is your mood, climate is your personality.” You may be a nice person most of the time, but if you are having a bad day, that can put you in a sour mood temporarily. Same thing goes with weather and climate. Climate gives you a “ballpark” estimate of what typically happens on a given day (normal high on September 10th is 85F), but weather is what is currently happening today (actual high of 80F). Category 4 hurricanes to make landfall in the Carolinas. Also, one could take these “spaghetti” type plots and provide some information about landfalls on the coast. The graphic below provides information as to how many times hurricane force winds (>= 74 mph) affect a certain county in the United States. 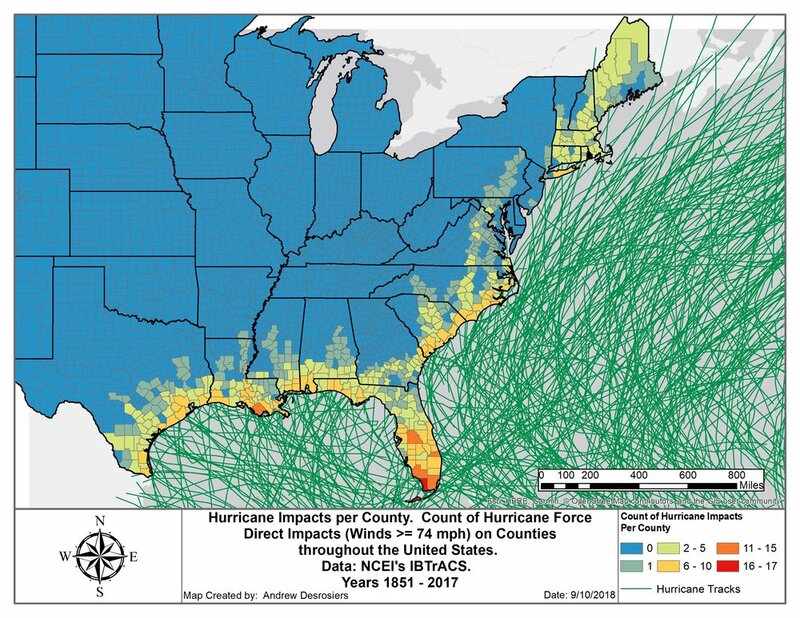 This GIS graphic, produced by colleague Andrew Desrosiers, shows that strong winds can be an important factor, even if one is hundreds of miles inland. I am a meteorologist, but very rarely forecast as part of my profession. My role in the community is to go backward (not forward) in time and analyze what has happened in the context of meteorology and climatology (similar to the above information). 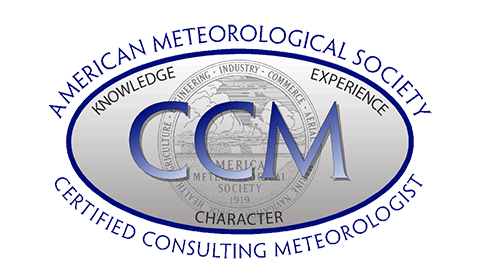 As a Certified Consulting Meteorologist, I am obligated to admit when I don’t have expertise in a particular area, and to suggest those that do. With that in mind, I would strongly suggest you listen to forecasts provided by the National Hurricane Center, and your local weather service office. Older PostWhich NFL stadiums have the nicest weather?